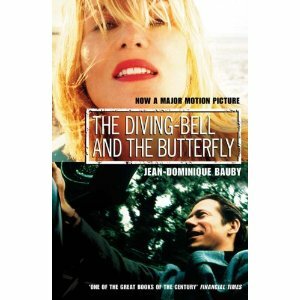 Jean-Dominique Bauby in his brilliant book, “The Diving Bell and the Butterfly”, illustrates perfectly how many of us can live, the world of our minds and the world of physical reality. After a stroke that left Bauby completely ‘locked in’ and with only the movement of one eye lid, he wrote this book by communicating letters with his eyelid. His mind was totally active but ‘locked in’ he was unable to communicate to the world around him, until one day his therapist discovered his ability to say yes or no with the blink of the eye. We “dream” without physical limits, personality constraints, free from emotional hurt……we are a butterfly that is free to skip through the air at will to this beautiful flower for a little rest before seeking out the next awesome smelling one. As a butterfly of the mind there is nothing we cannot do but then in the real world we can feel like we are dressed in one of those heavy underwater diving bell suits trying to clumsily move through life. Last week I felt so constrained by “dark” emotions that paralysed me from doing what I wanted to do. At one point the darkness causes physical sickness feelings and a nervous shaking of the body. Yet again I find myself retreating to the drug of sleep, I just shut out the world, I turn off for a few hours and dont have to face reality….I can go into sleep as the “butterfly” and pretend my world is normal, my Mike is with me and we carry on where we left of. Then I wake and find myself in the “diving bell” again! The sun is shinning, its a brilliant day, I will cycle to work and emulate the “butterfly” as best I can in the physical reality. When you cannot see the way forward, you feel your way. I remember many years ago a manager of mine asking me to articulate clearly my vision for the future. At that time I could not do that, it was unclear. I knew the compass direction but I did not have the map detail. For some personalities to function well in life, they need to know where they are going and the steps or process of getting there. For others, they can handle the ambiguity, the walk in darkness. My friend Mike said the other day with regard to a business venture he is involved in, “I cannot see my way across the river, I am feeling each stone under my feet”. Today that is where I am at. I cannot see the future as I did in the past…..and thats OK! We can watch others in what appears to be full on, clear purpose, achieving outcomes, doing “life”. We are just getting out of bed and feeling our way through today, doing what we need to do to fulfill our responsibilities whilst on the inside wondering where will I be in the future. The joy of life has been knocked out of us, we too at one time had a lot of activity in our lives and our minds were clearly focused. We look around and see many of our friends suffering, their worlds had a tsunami hit them. Others have not had a tsunami hit but unwanted change which either physically or emotionally dramatically changes how they do life today. And so we accept, there are times in life we cannot see, we keep moving forward by feeling our way; there are times of great joy and pleasure and the very next day times of sadness and suffering that cause us to loose our footing. We live with paradox, highs and lows, constants and change. If ever there was an anchor that keeps me sain in all of this and the ability to feel my way forward, its following in King David’s footsteps, “Bless the LORD oh my soul and all that is within me bless His Holy name”. Puffing up or Building up! This year is Kathy & mine 25th wedding anniversary and I am in my 50th year. As we have tried over the past 18 months to make sense of Mike’s death, I have underlined my belief that as I get older I have more questions than answers. But there are plenty of people who have the answers for me! And so I come to a little question for myself, am I puffed up or do I build up? Am I a bubble or a building? What if the knowledge I have is wrong? What if that knowledge doesnt benefit me or others? Even worse, what if that knowledge makes me proud and haughty? What if my knowledge makes me so puffed up I spew out arrogance? What helped me so much this past 18 months was not those who had answers, but those who showed love, those who edified, those who build up, those who helped me stand. Their character had been built up where they did not need to feel value from having all the answers, but in showing love. Its those people I need and want on my journey. I hope I too can be a building for others and not a bubble! Both Kathy and I have admitted to irrational fear about the girls. The other day I returned mid day to the house to find Akila still not up, it was 1:30 pm. She is 22 and doesnt have a job at present, so wouldnt logic tell you a youth in that situation would still be asleep! I could not hold back any longer, I had to go and wake her, she was totally snuggled in and I could not see her face. All I need to see is a movement or hear a breath. “Oh God please not again” is the thought as I put my hand on her…..and of course you get the “what do you want”……Oh how I love that belligerent youthful response…….its far nicer than silence! Kathy has started to say “I am unapologetic that I am complex…..I am made in God’s image!” We are complex and the emotional impact of a painful experience can lie in wait in the recesses of our minds and heart. My concern is not that I have this fear, its whether or not I allow it to govern negative behaviour. Yes I know with my head, I trust God, He is in control, blah blah blah but its getting the head and the heart in this area aligned. Kathy is in the Ukraine for work and every day I can see her online and we type to each other via Skype. She told me a story the other day of one of the team members who had been attacked several years ago. Yesterday I could not see her online and in those recesses, I started to worry. Again this morning she was not online…..but then down in the right hand corner of the screen 20 minutes later….”Kathy has just signed in”. Oh what relief! You are currently browsing the www.mkknight.com blog archives for March, 2011.